As I was weeding my way through the various Etsy forums, I encountered a title indicating '...acceptance on Craftgawker..'. I had never heard of them before and from what I read, getting accepted was difficult. "craftgawker is a gallery where anyone can showcase their art, crafting and photography skills. It's a place for you to discover new artists and handmade goods to inspire your own creations." It was indicated in the Etsy forums that in some circumstances, it has taken an artist multiple to several submissions before getting accepted. So I decided to give it a try. I had just finished creating my Plastique Fall Eco-Friendly Tote (made from Home Depot plastic bags) and had received several compliments on it. 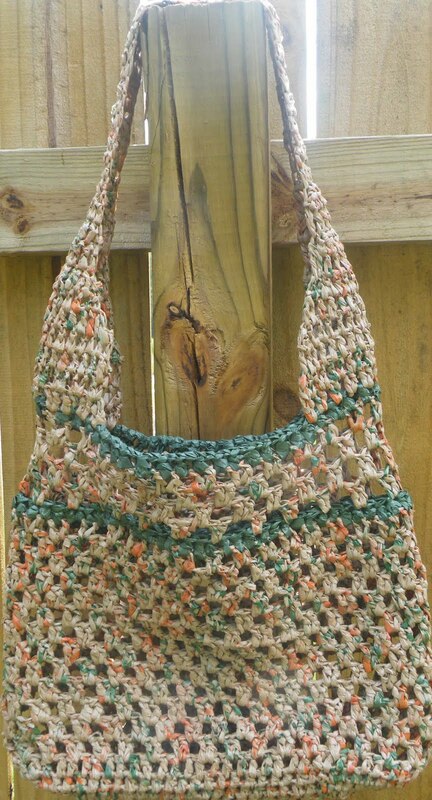 This is one of my favorite totes because of the gorgeous color combination of orange, green and brown. Other than a purchase, that is the second best form of flattery. Just convo me if you are interested. Wow!!! Love this bag! How resourceful of you. I would have never thought to do this...or did I know if was possible. I really love the color combination you chose. Perfect for Fall.